Can't You See I've Got The Blues? Yours Is My Heart Alone. The least interesting things here and the most dated are the impressions of other singers and actors. Davis had a penchant for this, and his record companies were certainly keen to cash in on it. So Davis gives us such tried and tested characters as fellow Rat Packer Francis Albert, Nat Cole, Billy Eckstine, Vaughn Monroe and Mel Tormé. Add to the mix Cary Grant (actually rather good), James Cagney, Edward G Robinson (actually rather bad) and Jerry Lewis and we have a recipe that now seems rather tired. Back in 1949, or in 1954, of course that wasn’t necessarily the case. Davis was a hoofer as well and one supposedly taught by Bojangles himself – the man to whom Davis paid eloquent tribute in a beautiful song, one in which the lachrymose and the verismo are held in precarious but ultimately successful balance. He recorded it very much later than this run of his earliest discs, which begin in January 1949 and end in November 1955, neatly anticipating the fifty-year copyright period. We start out of chronological sequence with the irrepressible brio of Something’s Gotta Give and pass through show and film tunes, standards, and a fair few killer dillers. He tap-dances on Smile Darn Ya Smile. And he scats – oh how he scats. He’s still finding himself on something such as 1949’s Please Don't Talk About Me When I'm Gone where the bop licks and Ella-ish ticks are all too formulaic even when propped up by his gigantic personality. The post-War love-in with bongos finds its nadir – and it’s a deep nadir - in I Ain't Got Nobody where the hep cat ends up sounding more like an alley cat. But gradually he recorded songs in arrangements more commensurate with his talent. It helped to have a good rhythm section behind him and Dave Cavanaugh’s band did possess men like Alvin Stoller, Don Lamond, Lee Young and that fine pianist Gerald Wiggins. The bongos were the work of one Karl Kiffe, though maybe he was only obeying orders. Even so Davis’s occasionally garish exaggerations – see Lonesome Road – were better channelled in a vehicle such as The Birth of the Blues, a song that suited his histrionic powers. When song, arrangement and band fused then Davis was as formidable a performer as any on stage. But then the relentless bravura was part of his act and we’d have been the poorer without it. These are good transfers of good sounding Capitols and Deccas. 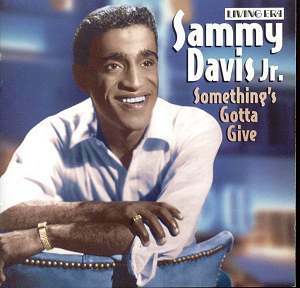 Inconsistent, yes, but always energising Sammy Davis is charted here from his earliest days on record to the cusp of his Hollywood and Broadway stardom. Few were more talented.